Tinned or freshly cooked lentils? I have to admit I use a mixture of tinned (canned) lentils and freshly cooked, although I lean more towards tinned lentils. I add fresh red lentils to soups, stews and dal, but if I'm using green, puy or beluga lentils I tend to buy them tinned or in ready to eat pouches. For this dish I used Napolina tinned lentils which are brown lentils in water. 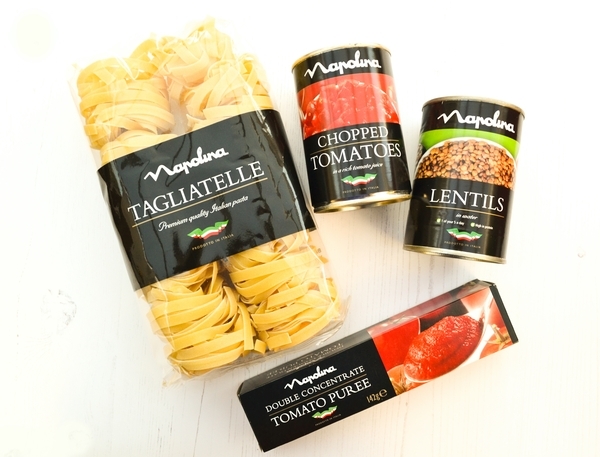 They are part of a new range from Napolina, that well known Italian brand. They have also introduced two ready to use sugar free jarred pasta sauces, tomato passata, extra virgin olive oil spray and two varieties of gluten-free pasta (green pea and red lentil). A ragu is an Italian meat sauce for pasta. What we call bolognaise or bolognese in this country is what would be known as a ragu in Italy. Ragu was originally created for Pope Pio VII by his chef Alberto Alvisi in the 18th century. 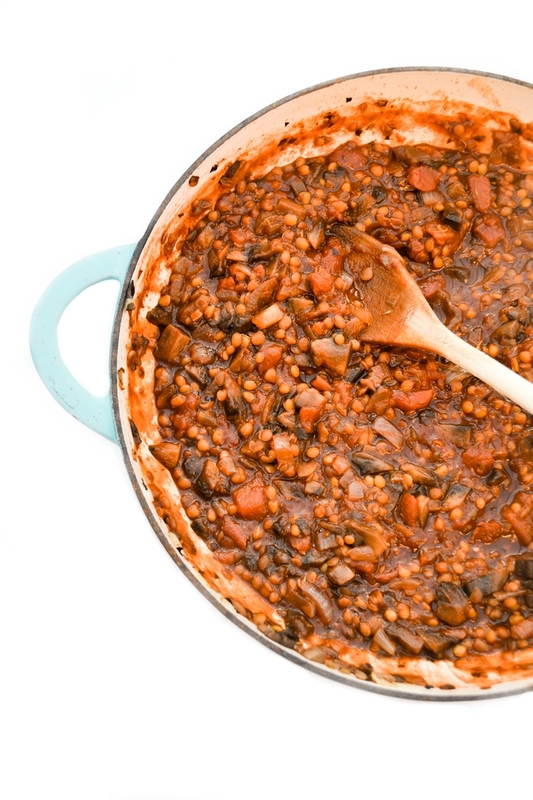 For a vegetarian or vegan ragu you can replace the meat with vegetarian (soya) mince or lentils. I replaced the meat with lentils in my mushroom and lentil ragu, but I usually add veggie mince to my bolognaise. Which pasta is served with Ragu? Another ragu (or bologanise fact) is that it is always served with tagliatelle in Italy, never spaghetti. Spaghetti bolognaise was introduced by Italians living in the UK for the British palate. 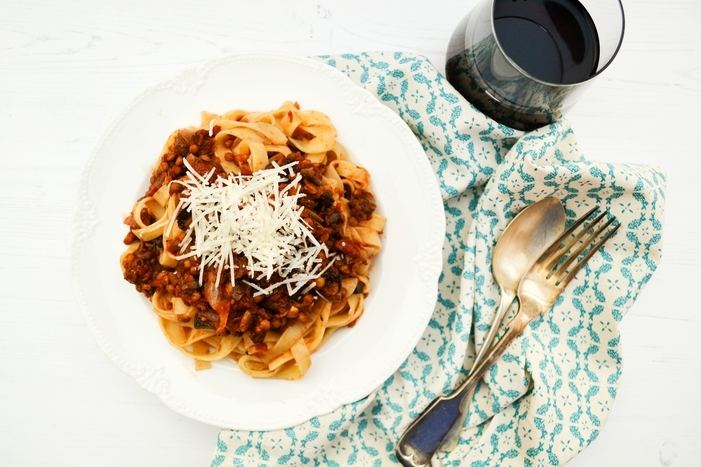 I serve this ragu with tagliatelle the Italian way. The sauce really coats the pasta. This mushroom ragu has only 132 calories when divided into 6 portions and 199 calories when divided into 4 portions. 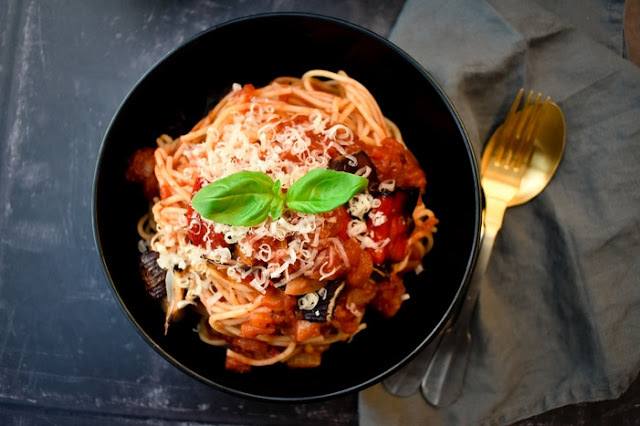 Add 66 calories for 50g of tagliatelle and that is 198 calories with paasta when the sauce is divided into 6 portions and only 265 calories with pasta when the sauce is divided into 4 portions. The sauce is low in fat and a great source of protein. It also contains iron, potassium and a little iron. It's perfect if you are following the new 5:2 diet, counting calories or just watching your weight. 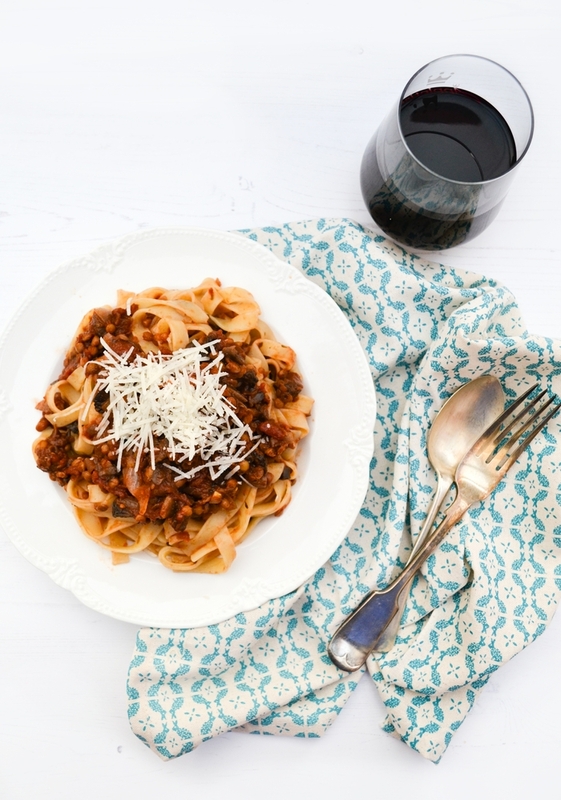 A rich mushroom and lentil ragu served with tagliatelle the Italian way. An easy your family and friends will love. Suitable for vegetarians and vegans. Add the mushrooms and cook those until they are soft too, then add the lentils, chopped tomatoes, thyme, wine and tomato puree. Crumble in the stock cube and stir well. Leave it to cook gently for 25-30 minutes until the sauce is rich and thick. Season with salt and pepper and serve with freshly cooked tagliatelle. 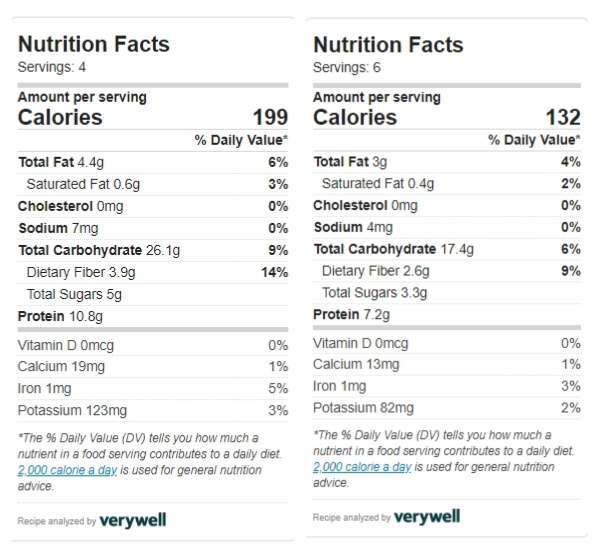 Calories for the ragu are 132 calories for 6 portions and 199 calorie for 4 portions. Add 66 calories for 50g tagliatelle per person. If you like my rich mushroom and lentil ragu, you may also like my tomato and roasted red pepper pasta sauce for spaghetti. Disclosure: I created this recipe to highlight new products from Napolina. I was not expected to write a positive review and any opinions expressed are my own. Did you mean 300g of mushrooms, not 300 mushrooms? ? Haha yes you got me there, it was supposed to be 300g. The g dropped off. I love lentils stewed with tomatoes, so good. 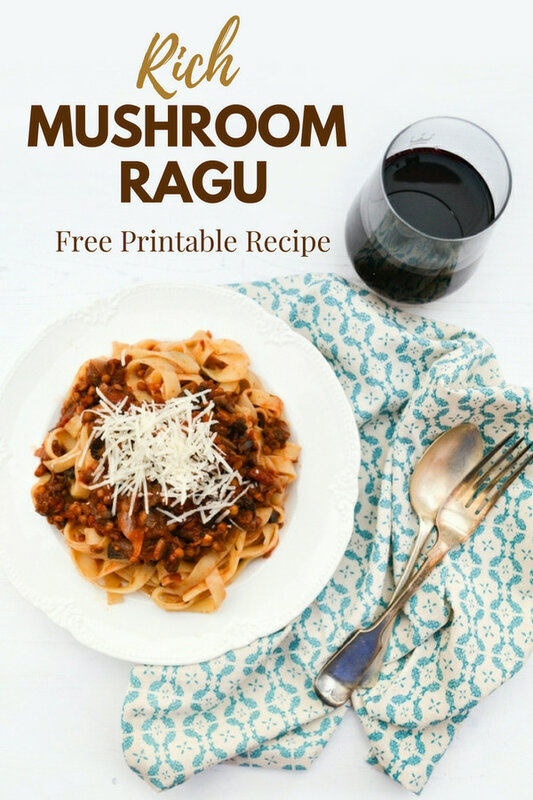 Your ragu is right up my alley! Thanks and yes it is a good combination. Ooo that looks so hearty and full of flavour! I used to love the Napolina brand when was in the UK. I always used their canned tomatoes. It's great that they are expanding their range. Canned lentils are so handy! Yes the tomatoes and really good quality. You see the difference when you use Napolina then a supermarket brand. Canned lentils are fab for adding to dishes. Haha me too and I love mushrooms so they were a must. This looks so good! Ragu is definitely a favorite in my house. Thanks, it's a new favourite here, well if you don't count bolognaise that is. My daughter has been thinking about going vegetarian and I think this would be a great "meaty" substitute for her. Oh yes I am sure she would love this it's a good transitional dish. This sounds delicious! So warm and comforting, perfect for fall! I'm pinning this to try soon, thanks! This is a perfect fall dish and mushrooms must be delicious, too. Saving for the weekend. Oh good, I hope you enjoy it. It depends what type, if they need soaked overnight and cook time. For instance red lentils or puy lentils don't need pre soaking and will cooking within the cooking time of the sauce, so they could just be thrown in although a bit of extra stock may be needed. Others that take longer I would precook. Do a batch and keep some for salads.